For all those of you considering getting started working on your car I’ve put together a short and simple video. 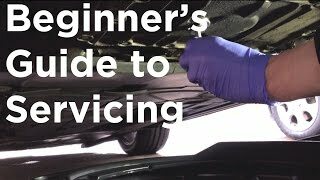 I did it primarily to show the cost savings doing it yourself but even if you never attempt anything the video should help to de-mystify what the basic service items are. By all means not a comprehensive list and there will probably be another video for what I’ve left out here. So, what is a car service? Well, some describe it as simply changing the engine oil. I will take you through the six major service items, tell you when on average they need doing and give you a cost comparison. I am excluding the cost of buying the tools to make simpler. Please check out this other episode for the essential tools you’ll need to buy to start working on your car. Service intervals vary from car to car so I’m going to give general figures for an average family car. You should consult your handbook or buy a manual for the correct intervals for your car. This is the big one. Not changing you oil and the filter will lead to engine damage. Change every 12, 000 miles or one year whichever comes first. Expect to pay about £180 pounds for a dealer to do this or £30 in parts if you do it yourself. Here is my step by step guide. Brake fluid will stops being as effective after about 2 years. A dealer will charge about £60 to change this but you can do yourself for £5 in parts. A dealer will also charge over £70 just to check your brakes and up to £350 to change the brake pads. Click here to check you brakes for free and here to save nearly £300 changing the pads yourself. When you change your tyres depends on how many miles you drive and how you drive. Click here to see my guide on how to check your tyres and see if they need replacing. The air filter removes dirt and particles from the outside air as it flows into the engine. It will eventually become blocked so replace it every 24,000 miles or 2 years whichever comes first. There is also a cabin filter that helps clean the air coming into the car though the heater and air con. Replace this 12,000 miles or every year. A dealer will charge up to £80 to replace them whilst they cost about £10 each and are simple to fit. A car Battery lasts about 5 years as after that it stops being able to hold a reliable charge and may not be able to start the engine. A battery will cost about £40 whilst a dealer will charge up to double to supply and fit. Not much to say on this one except make sure you buy a screen wash with anti-freeze to that it works in the winter and a detergent so that it can remove grease and dirt effectively. Most come concentrated so you can dilute it with tap water at home. You can buy 5 litres for £1.20 or have the dealer charge you £20. Last edited by neil_b; 03-24-2016 at 02:16 AM.